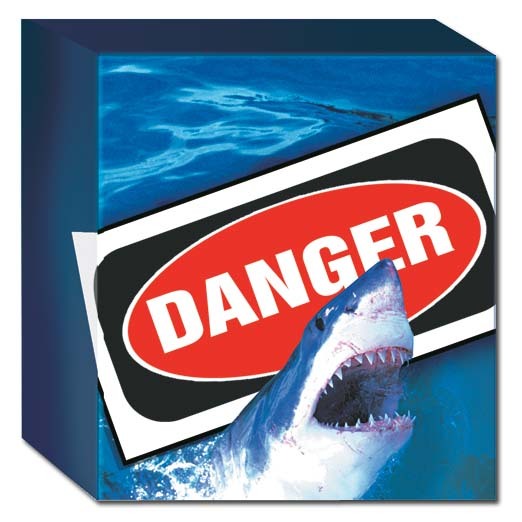 While a pretty standard specification for a Perth Mint series of coins, Deadly and Dangerous captured the imagination of collectors everywhere when the first coin debuted back in 2006. 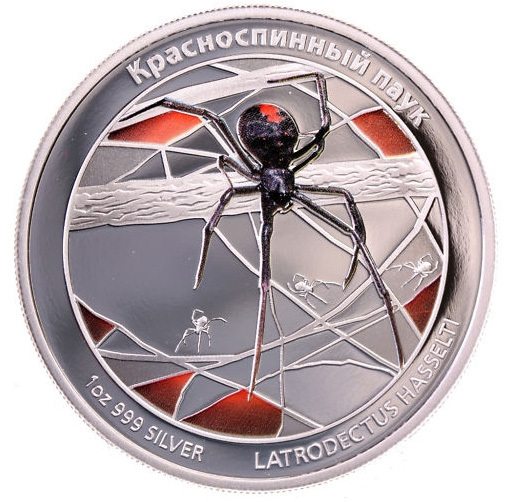 The first and foremost reason for this was the outstanding depiction of the feared Redback Spider that graced the reverse side of the coin, as well as a subject matter that remains immensely popular to this very day. Australian wildlife has a quite deserved reputation for having amongst its numbers a wide and varied range of species seemingly dedicated to causing us pain, discomfort and death. A mix of venoms and sheer physical brutality marks out this menagerie of mayhem, so clearly a great subject for a series of coins. Releasing a single coin on an annual basis, the Perth Mint strikes these coins for a third party (we believe for Australian distributor, Downies) and they’ve continued uninterrupted since 2006. 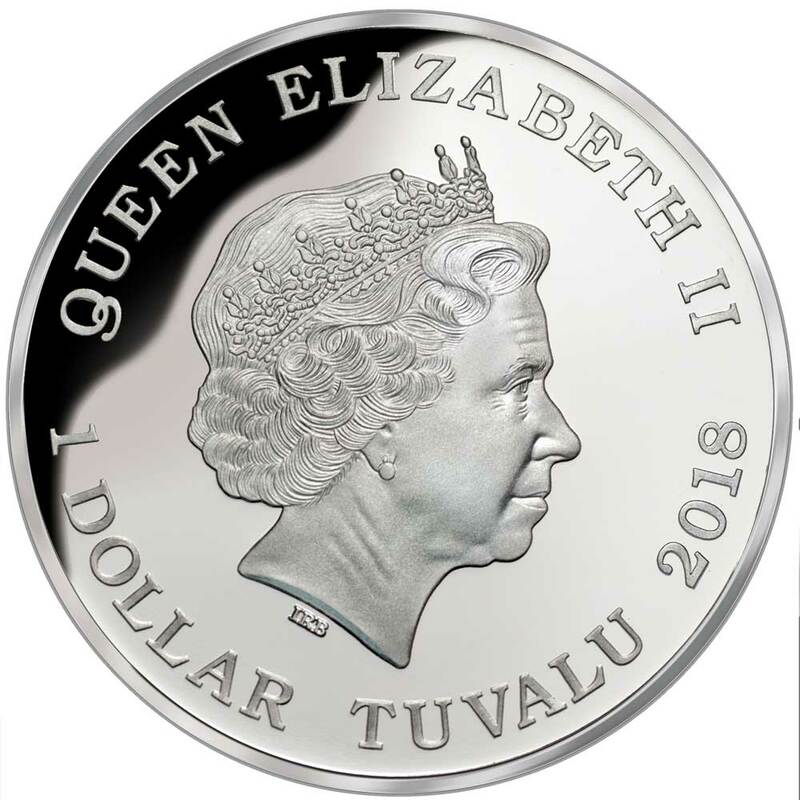 As we said, at one ounce of fine silver in weight, selectively coloured and struck on a 40.6mm blank, the coins are specified to the standard Perth Mint specification widely used on multiple concurrent series and one-off designs to this very day. Comments on various forums and discounts at many dealers have indicated that interest has been waning in the series over the last couple of years, but they do still seem to sell well, no doubt helped by the subject matter having broad appeal. 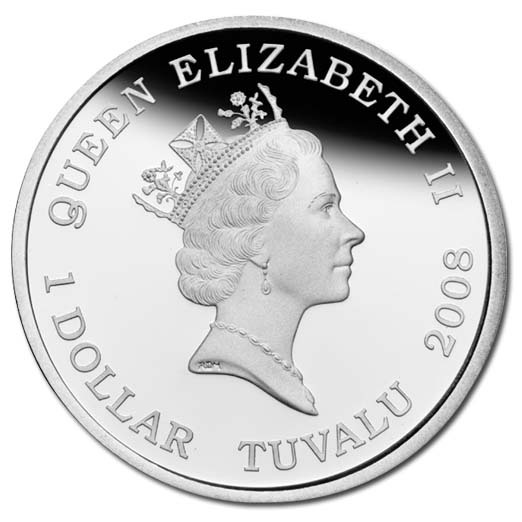 The first coin regularly sells for well over ten times its issue price, and while future coins have not quite lived up to expectations re. 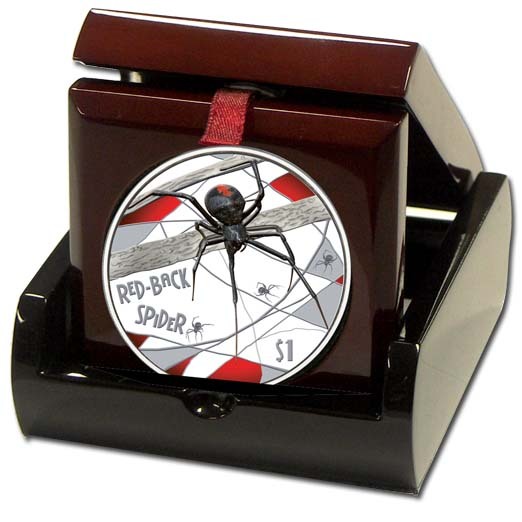 appreciation, several other coins do sell for elevated prices, although to nowhere near the Redback Spider level. In 2011, for what we can only assume was an attempt to satiate intense demand, the Perth Mint released the first five coins again for the Russian market. Having an altered design, the original artwork was shrunk and in the border surrounding it was some inscribed Russian text along with the latin name for the animal. 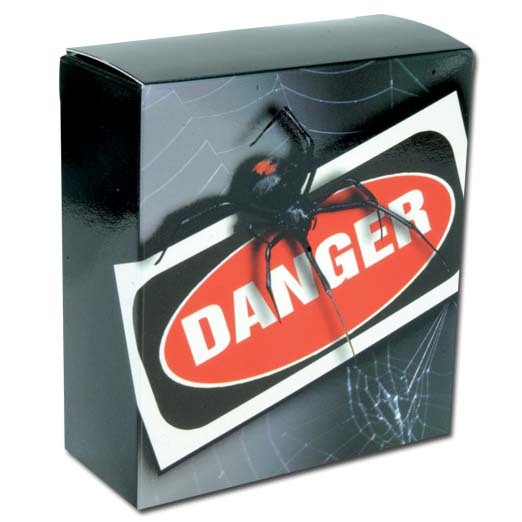 While not as nice as the original, they are official and a way to get the Redback at a sensible price. Ironically, a softening of prices of coins 2-5 often means the Russian versions sell for more. 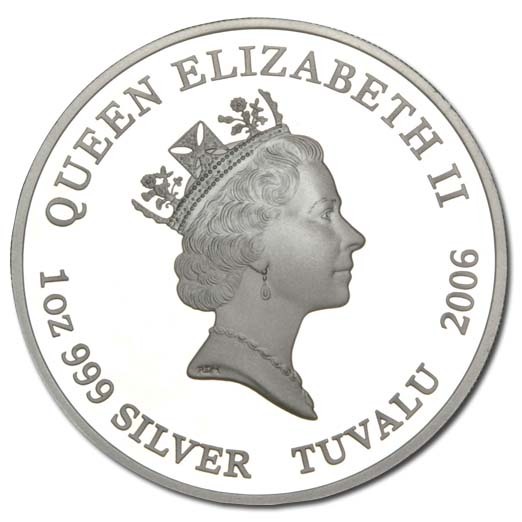 They do have a relatively small mintage of 2,000 each, compared to 5,000 of the original. 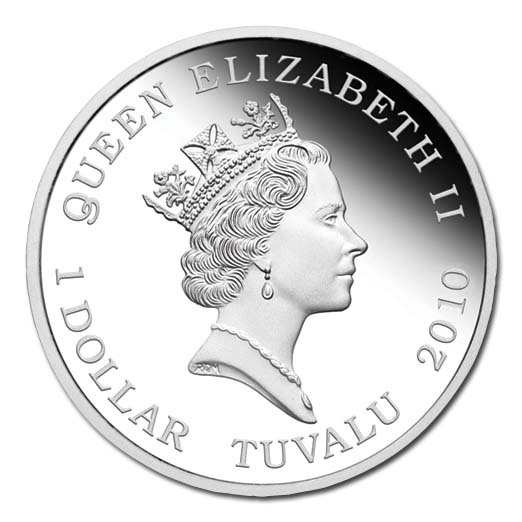 Supplied in some extremely nice packaging, the high-gloss wooden box with a removable holder that allows the coin to displayed vertically is much better than you’d expect for the price, although the Russian versions lose out and have just a standard Perth Mint snapper case. Overall, Deadly & Dangerous is a well-designed and deservedly popular range of coins that continues to expand with the range now up to eleven coins. Below we’ve laid out all the releases to date, newest first, with a description of the animal and just for fun, arating of how deadly the animal is if it attacks, and how dangerous it is if you’re near one. The Dingo (Canis lupus dingo) is another famous Australian native, this time a medium-sized feral dog. Noted as living with indigenous Australians by the original British colonists, this tough dog is well known for its speed, agility and stamina. 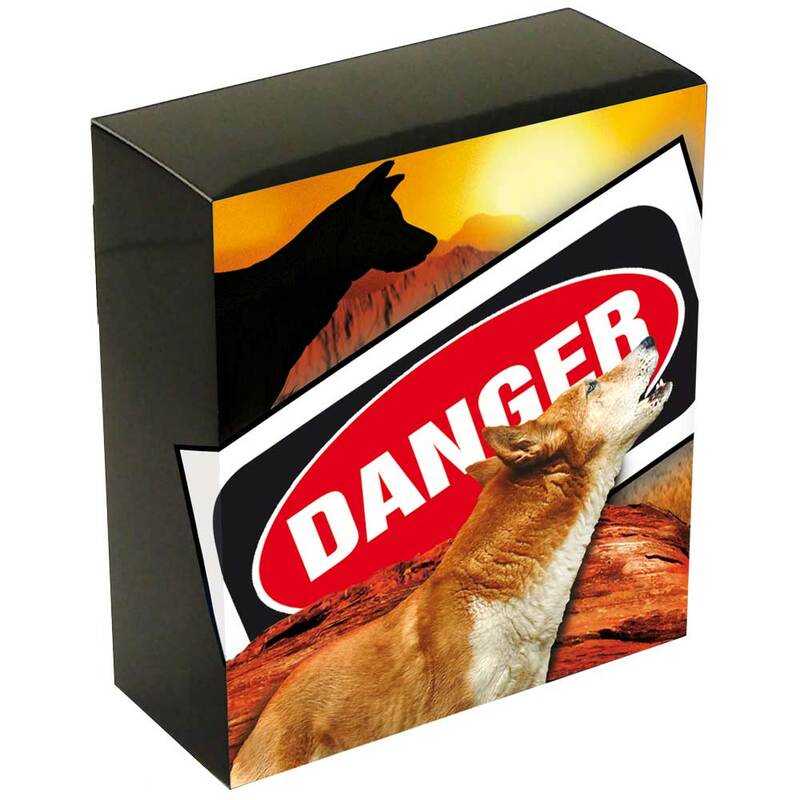 The dingo generally has a coat that is either light ginger (or tan), black and tan, or creamy white. The dingo’s distribution covers a variety of habitats, including the temperate regions of eastern Australia, the alpine moorlands of the eastern highlands, the arid hot deserts of Central Australia, and the tropical forests and wetlands of Northern Australia. While they will eat birds, reptiles, fish, crabs, frogs, insects and seeds, the prefer a diet of mammals and will take individuals up to the size of a large Red Kangaroo, for which they seem to have a fondness. They have no real predators of their own, although they can be killed by cattle and snakes, and the young are sometimes taken by birds of prey. They’ve suffered at the hands of man in the past because of attacks on livestock, but actual attacks on human are very rare. There have been famous cases of babies being taken, but they’re extraordinarily rare and not indicative of this animals usual behaviour. 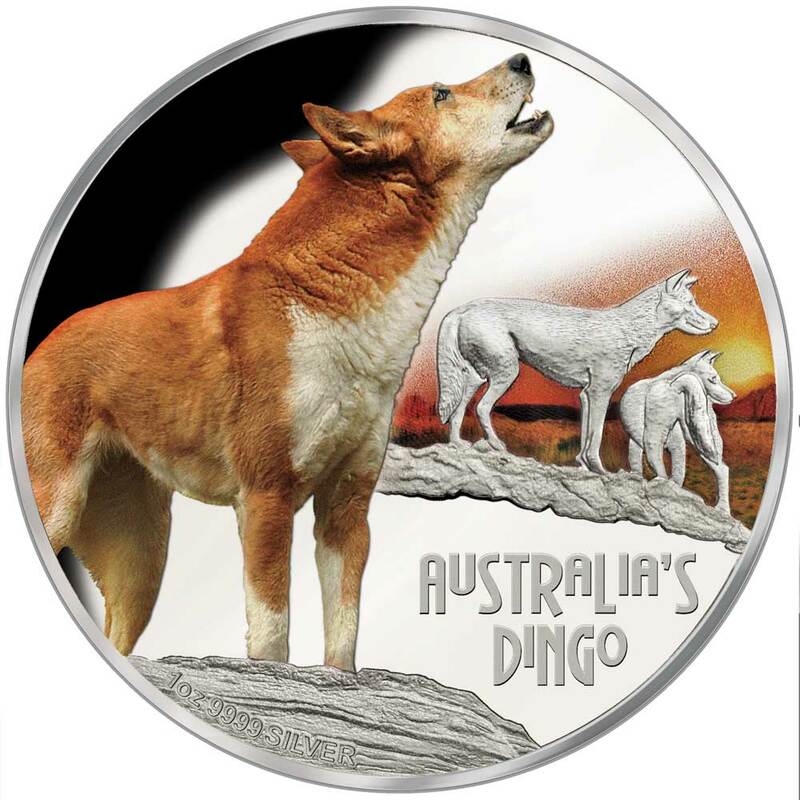 DESIGN: The coin’s reverse features one dingo howling with a pair looking out over an outback landscape in the background. The design also includes the inscription AUSTRALIA’S DINGO, the 2018 year-date and The Perth Mint’s ‘P’ mintmark. Commonly found in warm, shallow waters along coasts and in rivers, the Bull Shark is quite capable of travelling a considerable distance upstream into a freshwater river. They’ve been known to travel up the Mississippi River as far as Illinois for example and several attacks hundreds of miles up the Ganges have been noted. 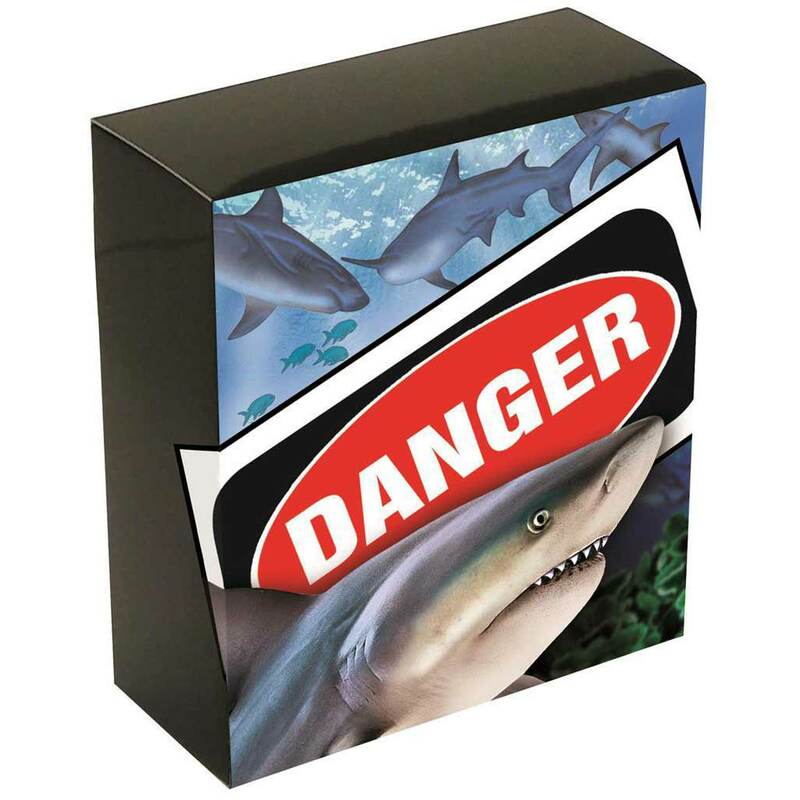 Considered the most dangerous shark in the world because of its preference for hunting close to shore and for having a giant-sized chip on its shoulder. They’ve been known to weigh over 300kg and one example was recorded at 4 metres in length. The bull shark’s diet consists mainly of bony fish and small sharks, including other bull sharks, but can also include turtles, birds, dolphins, terrestrial mammals, crustaceans, echinoderms, and stingrays. They hunt in murky waters where it is harder for the prey to see the shark coming. Bull sharks have been known to use the bump-and-bite technique to attack their prey. After the first initial contact, they continue to bite and tackle prey until they are unable to flee. Typically an apex predator, they can be taken by both Great White Sharks and Saltwater Crocodiles however. 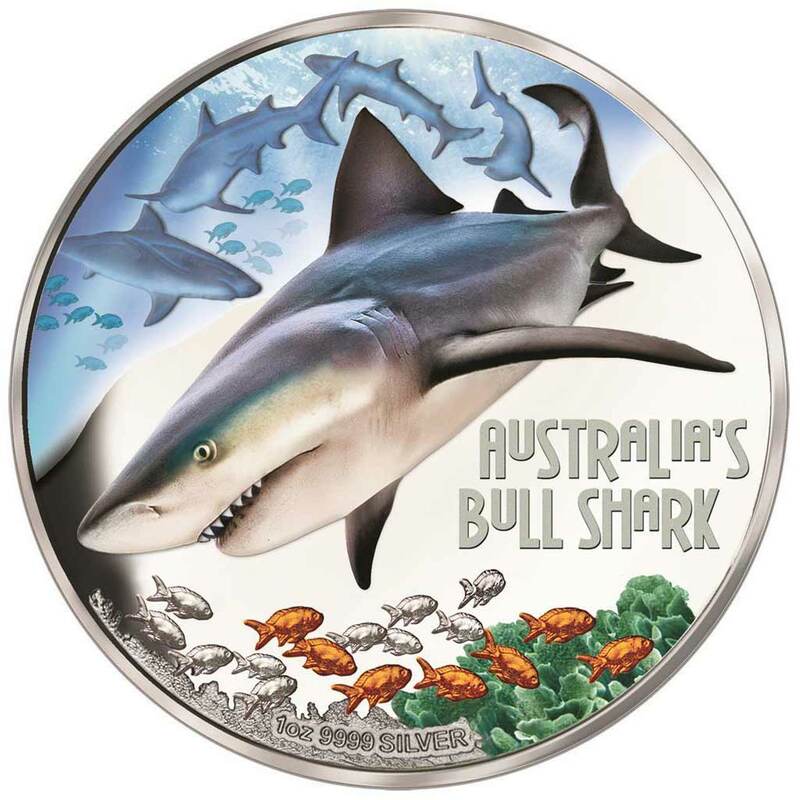 DESIGN: The coin’s reverse features a large bull shark with smaller bull sharks in the background as well as coloured fish and coral. The design also includes the inscription AUSTRALIA’S BULL SHARK, the 2017 year-date and The Perth Mint’s ‘P’ mintmark. The common death adder (Acanthophis antarcticus) is one of the most venomous land snakes in Australia and globally. It’s distributed over much of eastern and coastal southern Australia – Queensland, New South Wales, Victoria and South Australia. Common death adders are found in forests, woodlands, grasslands and heaths of the eastern coast of Australia where it is a master of camouflage, due to its band stripes, hiding beneath loose leaf litter and debris in woodland, shrubland and grassland. Common death adders eat small mammals and birds as a primary diet. It covers itself with leaves—making itself inconspicuous—and lies coiled in ambush, twitching its grub-like tail close to its head as a lure. When an animal approaches to investigate the movement, the death adder quickly strikes, injecting its venom and then waits for the victim to die before eating it. The death adder is not aggressive and less of a threat to humans, but contains highly toxic neurotoxin which can cause paralysis or even death. 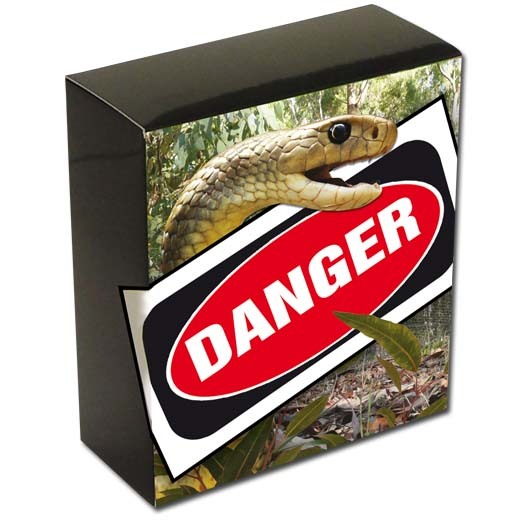 It can deliver the fastest strike among all venomous snakes recorded in Australia. Human death can occur within six hours after the bite. 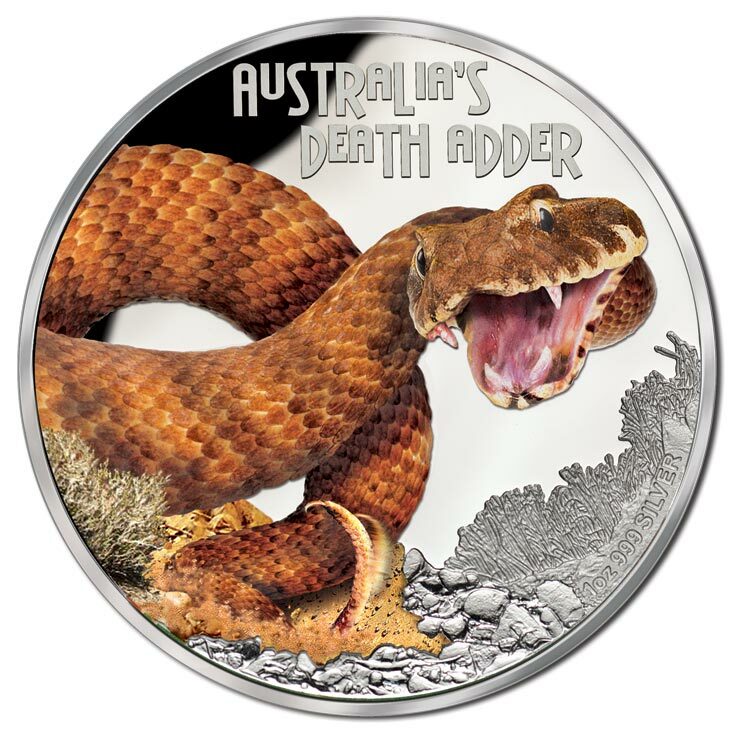 DESIGN: The reverse of the coin features a coloured Australian Death Adder resting on the ground and preparing to strike. 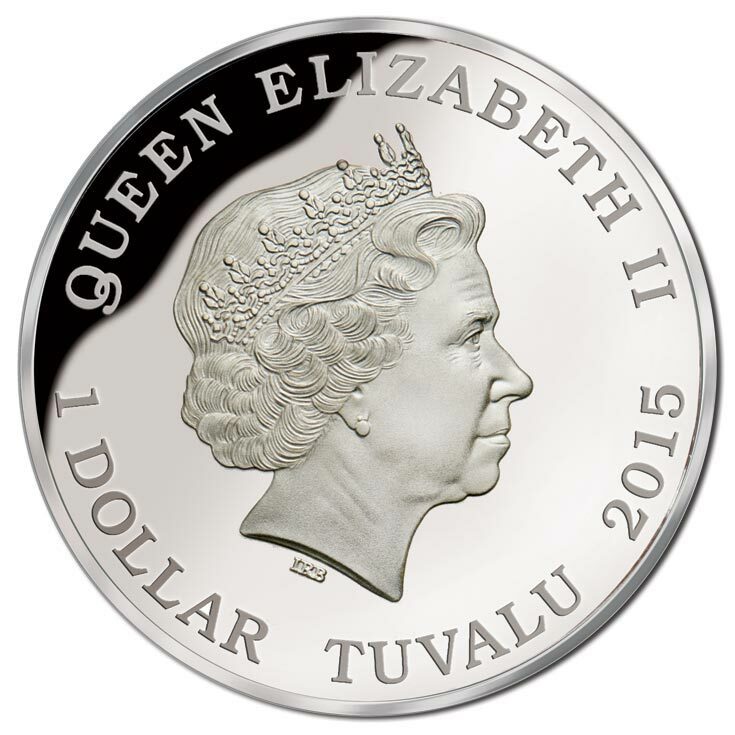 The inscription AUSTRALIA’S DEATH ADDER also appears in the design. Amongst the world’s oldest ants, having first appeared approximately 100 million years ago, Bull Ants were once found in both the Americas and Europe. Believed to have been first discovered in Australia by Sir Joseph Banks in 1770 whilst sailing the world with James Cook, Bull Ants are today known by over 90 species – all but one of which are endemic to Australia. 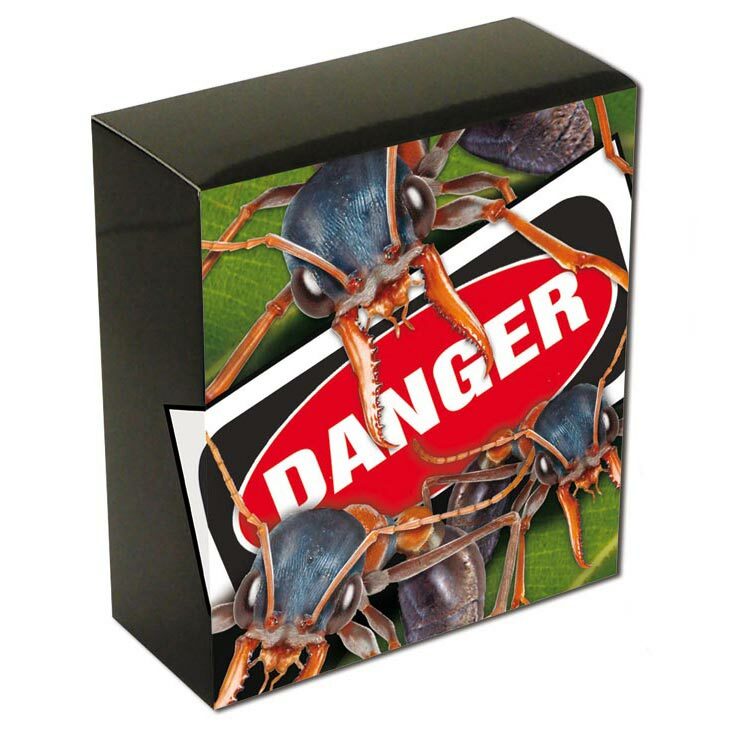 Well known for its large powerful jaws and venomous stinger, the Bull Ant has been certified by Guinness World Records as the world’s most dangerous ant, having caused a number of deaths to humans allergic to their powerful venom. 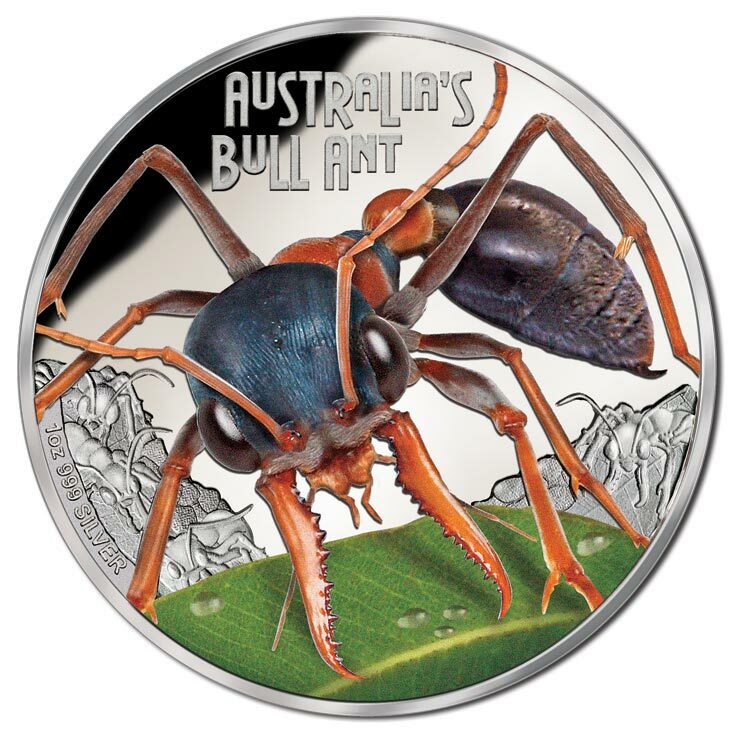 DESIGN: The reverse of the coin features a coloured Australian Bull Ant resting on a leaf while in the background numerous other ants swarm around. 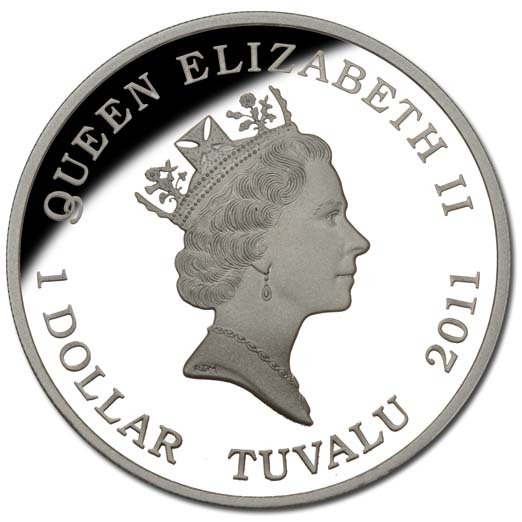 The inscription AUSTRALIA’S BULL ANT also appears in the design. Despite popular belief, spiders are not always the predator in the macro world, often coming off second best to the occasional centipede or wasp. Very few arthropods have spiders as their main diets, but one such creature is Isometroides vescus, the Australian Spiral Burrow, or Spider-hunting Scorpion. With a diet almost exclusively made up of Wolf Spiders (Lycosa), this charming little monster wanders Australia stuffing its face with hairy legs. Found all over Australia, Fiji, Hawaii, Tahiti and Samoa, and growing up to 6cm (2.4″) in length, this orangey-yellow scorpion is not deadly to humans, although they are venomous. 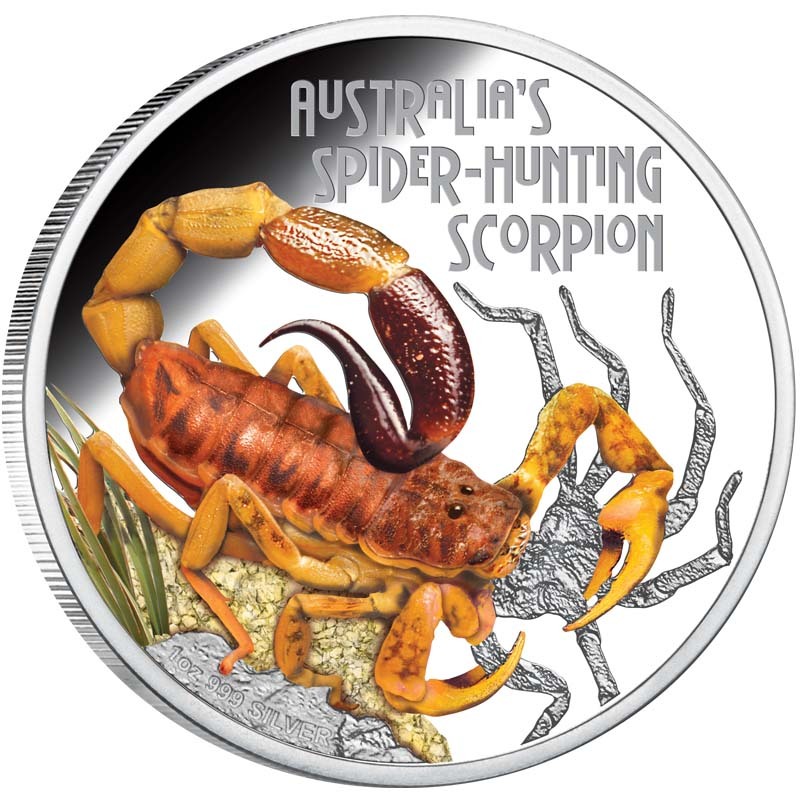 DESIGN: The reverse of the coin features a coloured Australian Spider-Hunting Scorpion resting on grass and gravel, preying on a struck spider. The inscription AUSTRALIA’S SPIDER-HUNTING SCORPION also appears in the design. 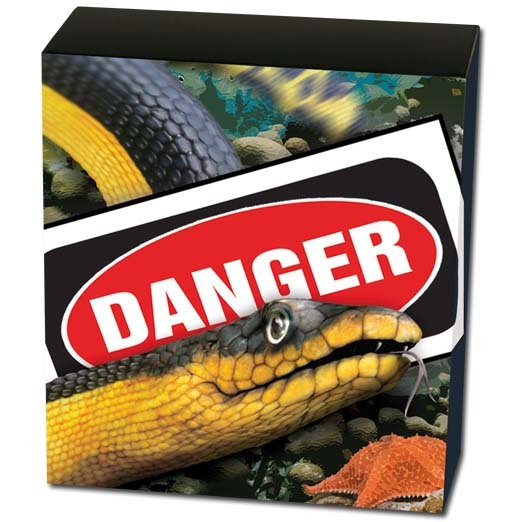 Living up to its deadly and dangerous reputation, this boldly striped yellow and black snake has venom that is more toxic than that of a cobra. The most widely distributed sea snake species, it can be found in warm waters of the Pacific and Indian oceans where it feeds mostly on fish. 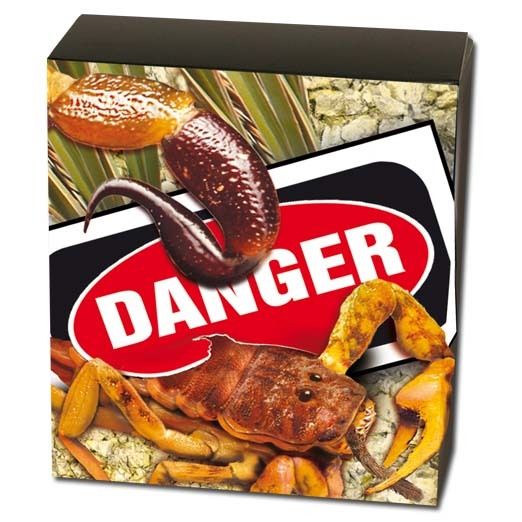 No deaths have been recorded from bites in Australian waters and only one death has ever been recorded, helped no doubt by a very effective anti-venom. 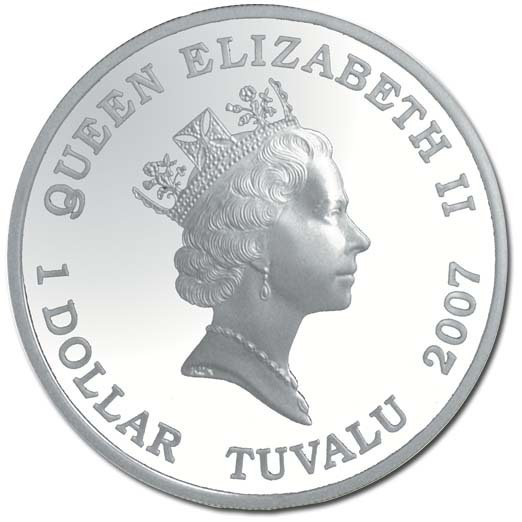 DESIGN: The coin’s reverse features a Yellow-Bellied Sea Snake in colour with a coral reef, star fish and other marine life in the background. 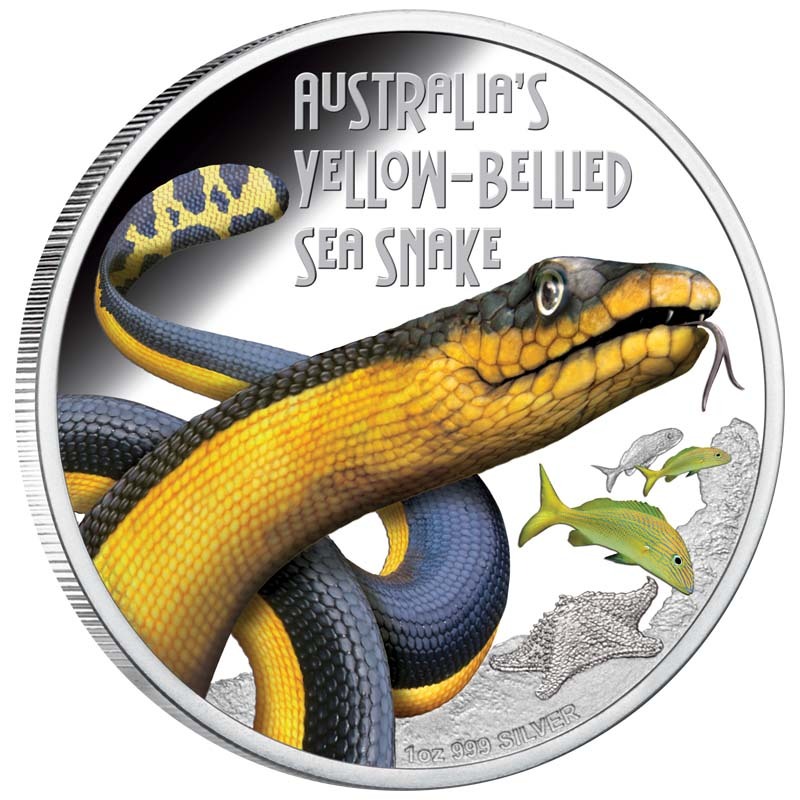 The inscription AUSTRALIA’S YELLOW-BELLIED SEA SNAKE also appears in the design. 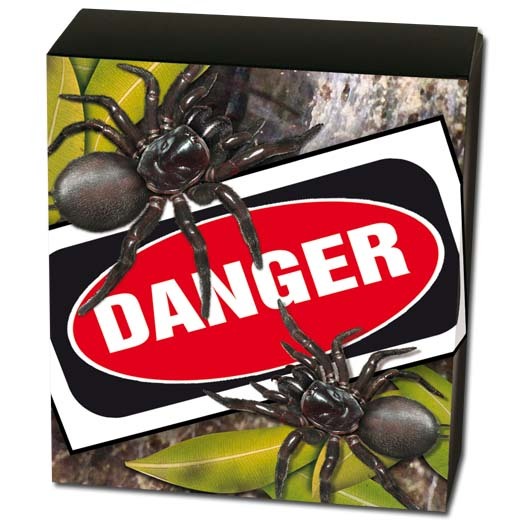 With highly toxic venom produced in large amounts and large fangs to inject it, the Sydney funnel-web is without a doubt The deadliest spider in Australia, and very likely the world, the Sydney Funnel-Web spider is found in New South Wales and commonly found in urban areas as well as forests. Having the habit of finding itself humid sheltered places, they can even survive, and bite, if they fall in a swimming pool. Very aggressive when threatened, they have fangs larger than a brown snake’s and they’re powerful enough to pierce toenails. Just 1.5-3.5cm in size, their venom has a compound that can attack the human nervous system and is quite capable of killing. Since the antivenom became available in 1981, there have been no fatalities. 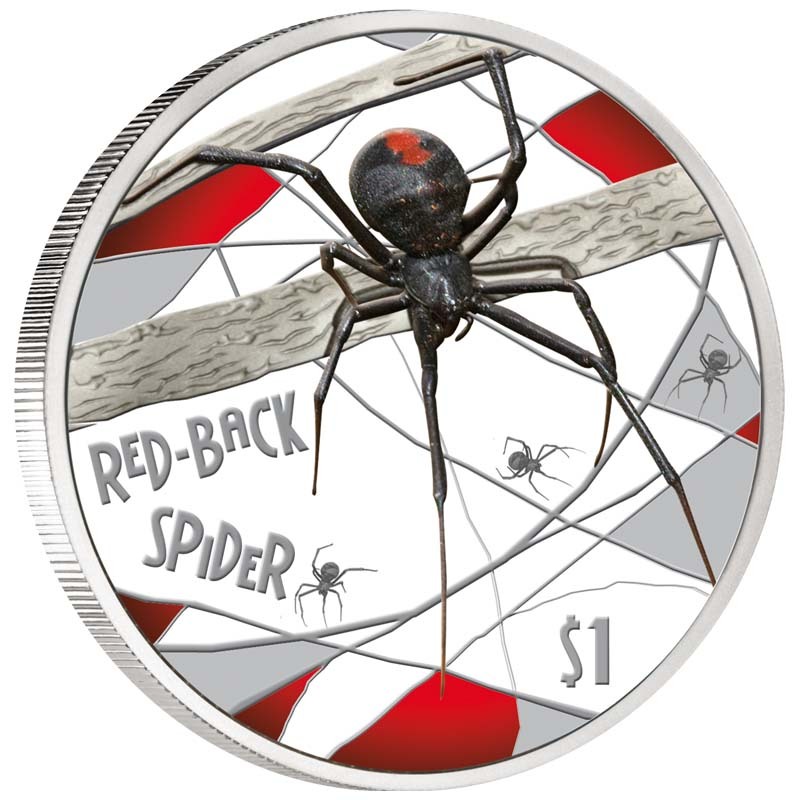 DESIGN: The coin’s reverse depicts a deadly Funnel Web Spider against a coloured background of its web and leaves. 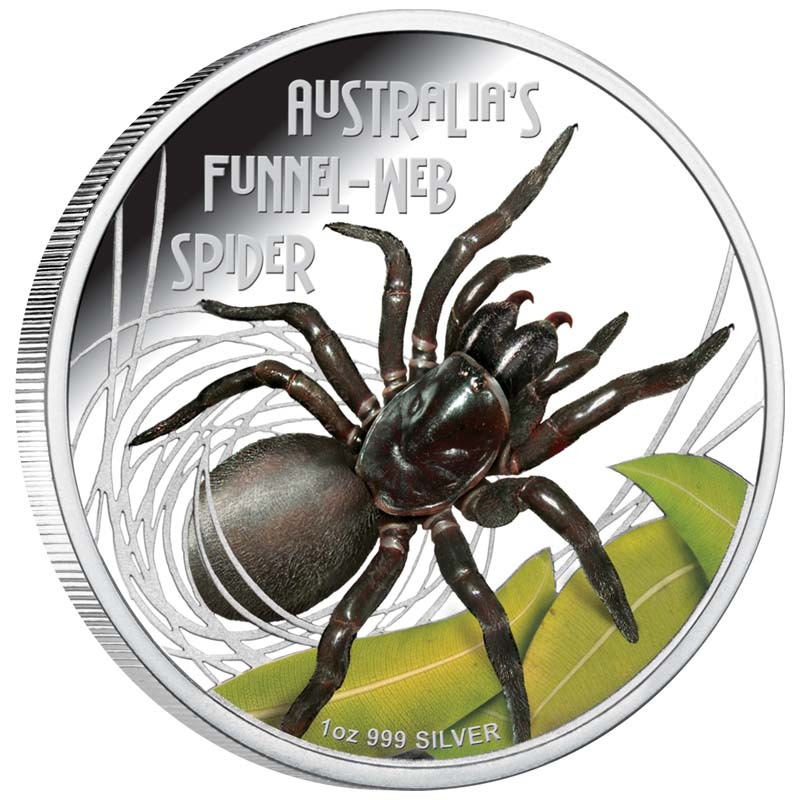 The inscription AUSTRALIA’S FUNNEL WEB SPIDER is included in the design. 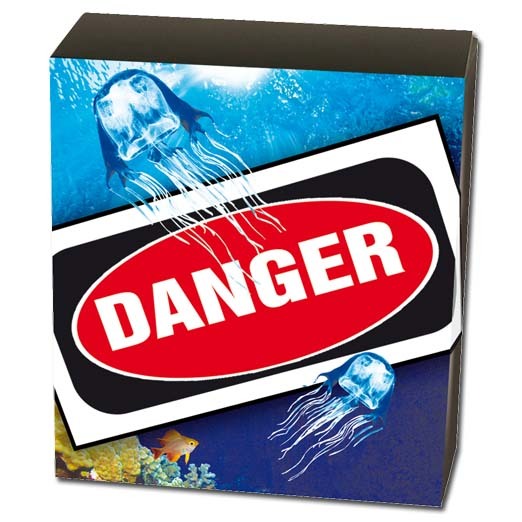 Able to kill in minutes, since 1883 the Box Jellyfish has been responsible for at least 80 known deaths, though likely many more. They have tentacles that are generally invisible, can entangle you and have millions of harpoons that inject a lot of venom at once. The venom contains hemotoxins (which affects the blood and attacks organs) and neurotoxins (which attack the brain), as well as substances which cause scarring on the skin. The sheer agony of the sting can cause cardiac arrest in a couple of minutes. Failing that the venom will polish you off in 30 minutes. DESIGN: The coin’s reverse depicts a Box Jellyfish against a coloured background of coral reef and tropical fish. 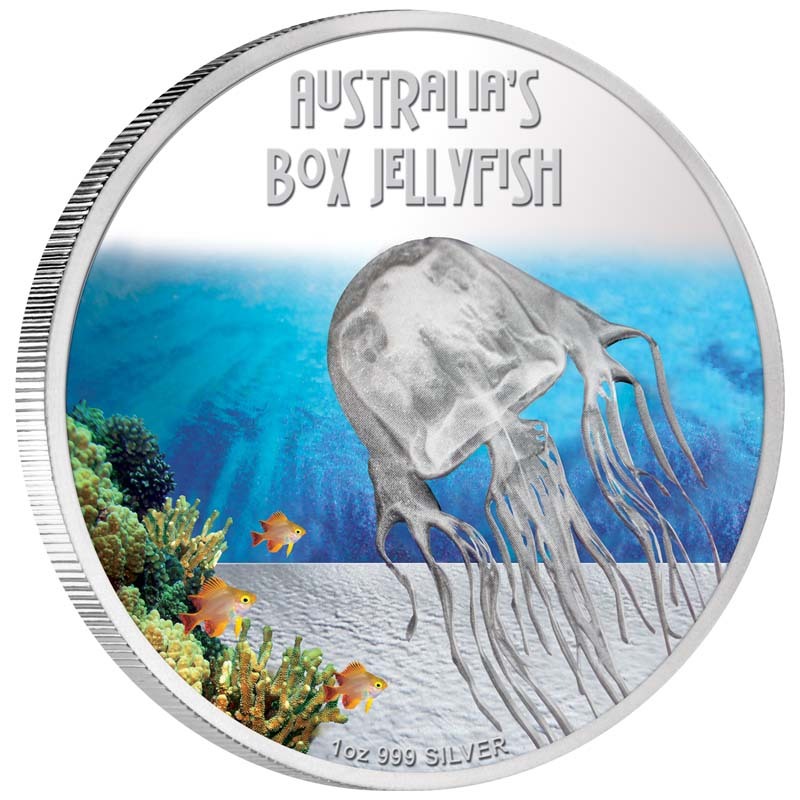 The inscription AUSTRALIA’S BOX JELLYFISH is included in the design. Responsible for 24 known deaths in the last 35 years, the Eastern Brown Snake is regarded as the second most venomous land snake in the world. 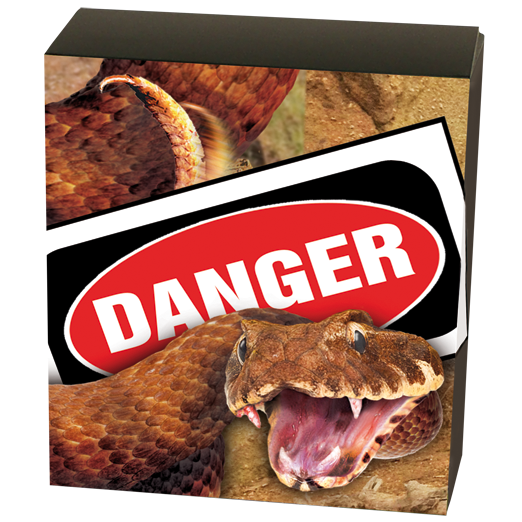 On average, one person is killed by this snake every year, which makes it the deadliest snake in Australia. The bite can cause cardiac arrest but more commonly leads to rapid and uncontrollable bleeding and kidney failure, with symptoms seen within 15 minutes of the bite. It’s found in urban areas, throughout eastern Australia and an isolated population occurs in the Northern Territory, meaning it’s one of the more commonly encountered snakes. 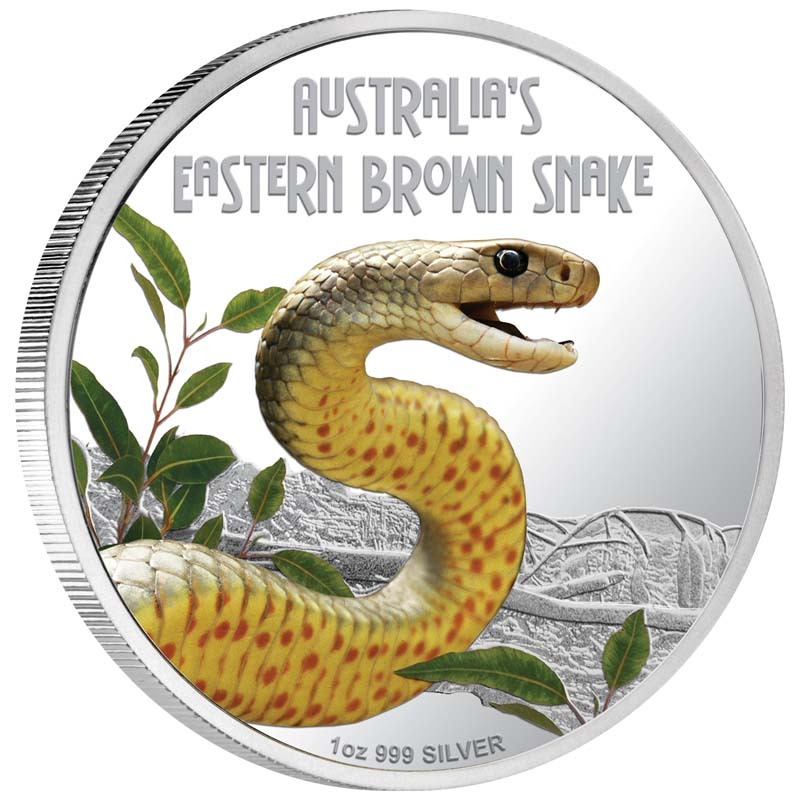 DESIGN: The coin’s reverse depicts a spectacular coloured image of an Eastern Brown Snake. With its head high and neck in an ‘S’ shape, the agitated animal is ready to strike. The Saltwater Crocodile (Crocodylus porosus), also known as saltie or estuarine crocodile, is the largest living reptile, and the males of this species can reach sizes of up to 6.7 m and weigh as much as 2,000 kg. It can live in salt water, but usually resides in mangrove swamps, estuaries, deltas, lagoons, and lower stretches of rivers. The saltwater crocodile is a formidable and opportunistic hypercarnivorous “apex” ambush predator capable of taking almost any animal that enters its territory, including fish, crustaceans, reptiles, birds and mammals, including other predators. 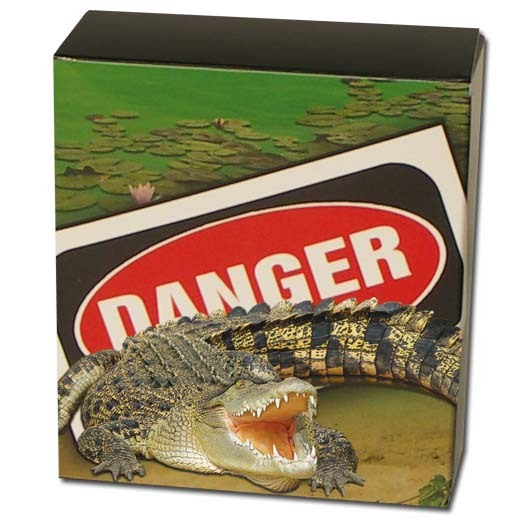 Due to their size and distribution, saltwater crocodiles are the most dangerous extant crocodilian to humans and there are 1-2 deaths every year in Australia. 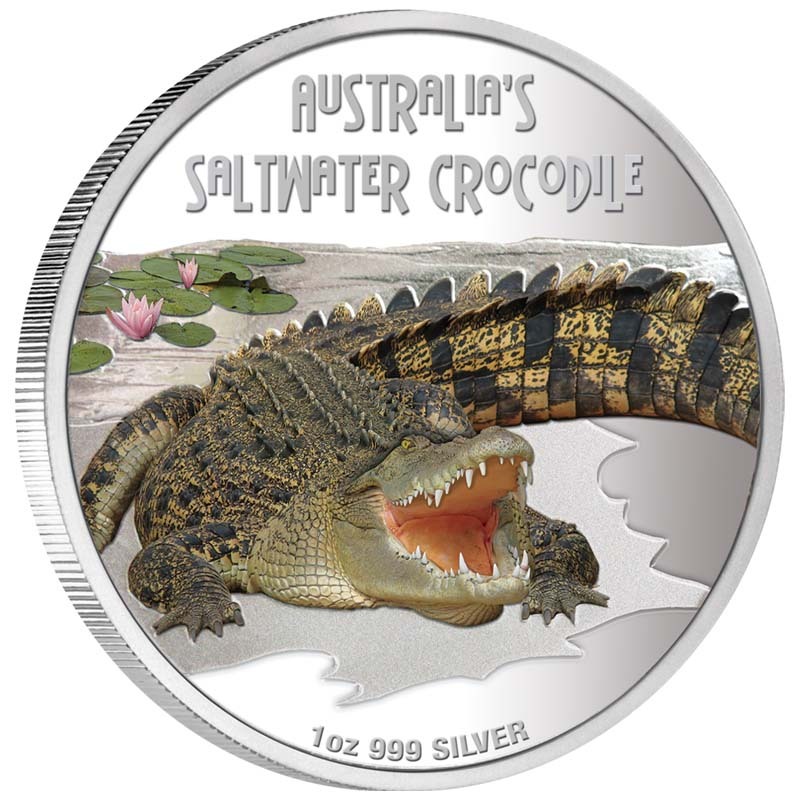 DESIGN: The coin’s reverse portrays Australia’s deadly and dangerous saltwater crocodile with its jaws agape. Each small octopus carries enough poison to kill two dozen humans and it’s the same nerve toxin as that found in Japanese delicacy, Fugu fish. 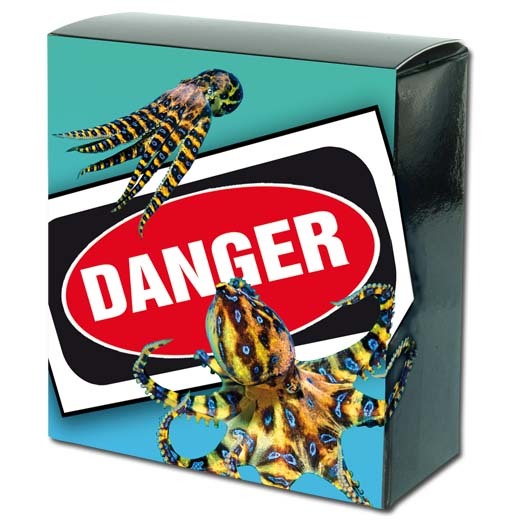 The blue-ringed octopus has only been attributed with causing three known deaths, but there have been no deaths since the 1960s and hospital admissions are exceedingly uncommon. The bite is slight and produces at most only a small laceration with no more than a tiny drop of blood and little or no discoloration. Bites are usually reported as being painless and often the victim doesn’t even know they’ve been bitten. 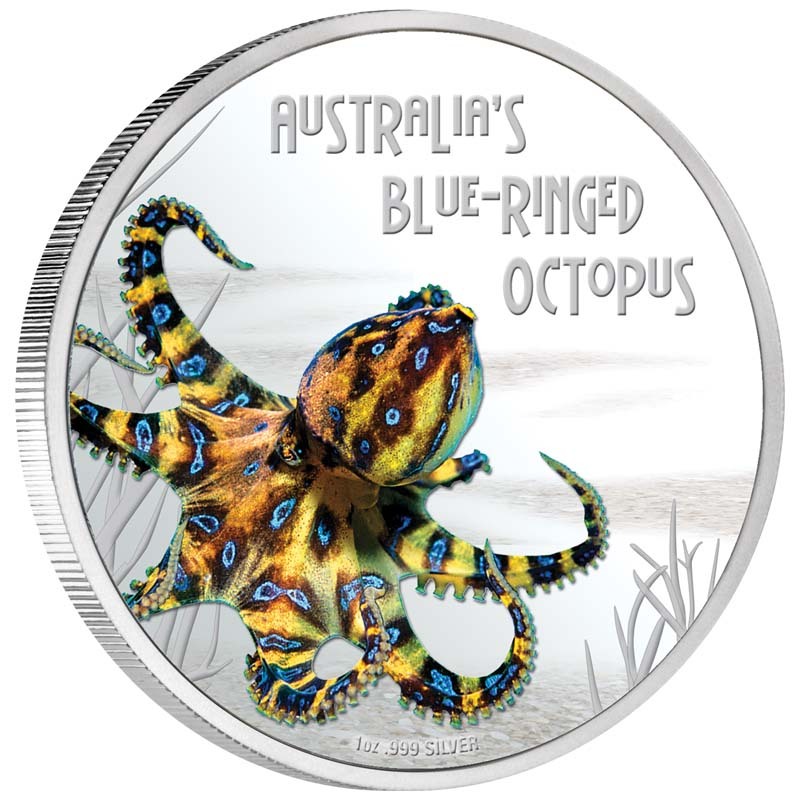 DESIGN: The reverse portrays the deadly and dangerous Blue Ringed Octopus displaying its vivid blue markings. One of the most impressive of living creatures, the Great White Shark is an apex predator found in the coastal surface waters of all the major oceans and has no natural predators other than the Orca (Killer Whale). Mainly known for its size, mature individuals have been recorded growing up to 6.4 m (21 ft) in length, although reports have been published of great white sharks measuring over 8 m (26 ft), and 3,324 kg (7,328 lb) in weight. The shark reaches maturity around 15 years of age and was previously believed to have a life span of over 30 years. The true lifespan of great white sharks is far longer; now estimated to be as long as 70 years or more, making it one of the longest lived cartilaginous fish currently known. Great white sharks can accelerate to speeds that exceed 56 km/h (35 mph). 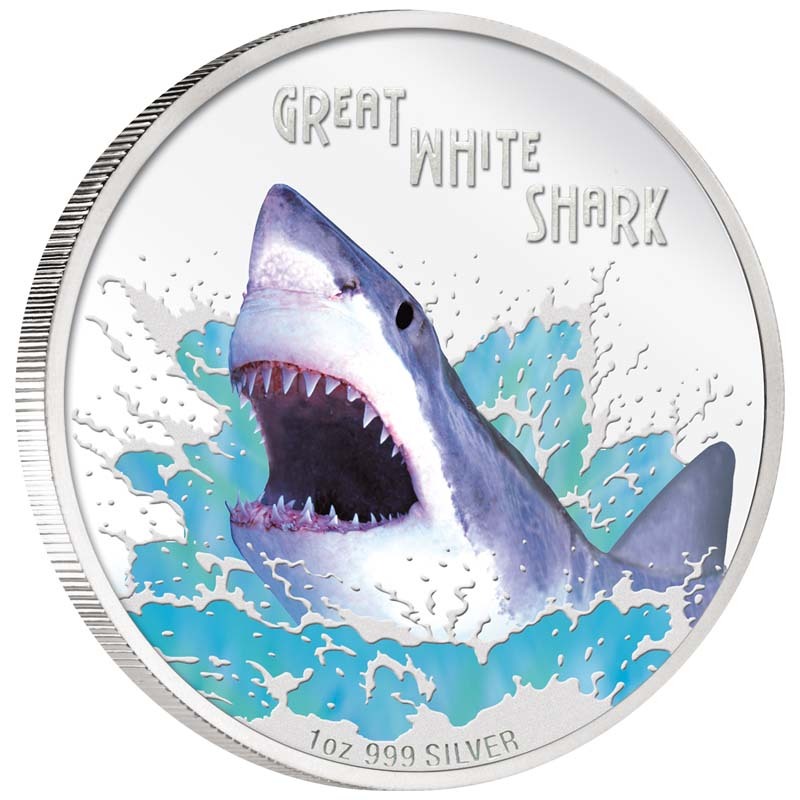 DESIGN: The reverse portrays a chilling coloured image of the gaping jaws and conical snout of a Great White Shark. Found throughout Australia, including urban areas, they like to hide in dry, sheltered places such as garden sheds, mailboxes and famously, under toilet seats. Around 2000 people are reportedly bitten each year, about 1 in 8 receiving antivenom, and no fatalities have been recorded since the availability of antivenom in the 1950s. The bigger female is 1cm long and is recognisable by the red stripe on its back that gives the spider its name. Their venom affects the nervous system, but small fangs make many of the bites ineffective. A bite is extremely painful and can remain so for days in many cases. DESIGN: Striking black and red colouring on the reverse design brings this little devil in to sharp focus on the coin’s brilliant mirror-like background.